iTab: it’s an iPhone, only bigger. Much, much bigger. Presenting iPhone apps to a large audience always presents a problem. Whilst Steve Jobs has a natty cable that projects his iPhone onto a big screen, they don’t make one available to us ordinary folk. The solution? I borrowed an idea from a friend, and made a bracket to mount the iPhone in front of a video camera (held together with gaffer tape). It kind of works, but it’s very shakey and very clunky. And if the projector is ceiling mounted, it’s too high to plug the cable in at all. I think I’ve found a proper solution though. I was at an exhibiting show a couple of weeks ago and saw the iTab, which looks and works like a giant iPhone. With screen sizes up to 86″ it looks good in front of an audience. 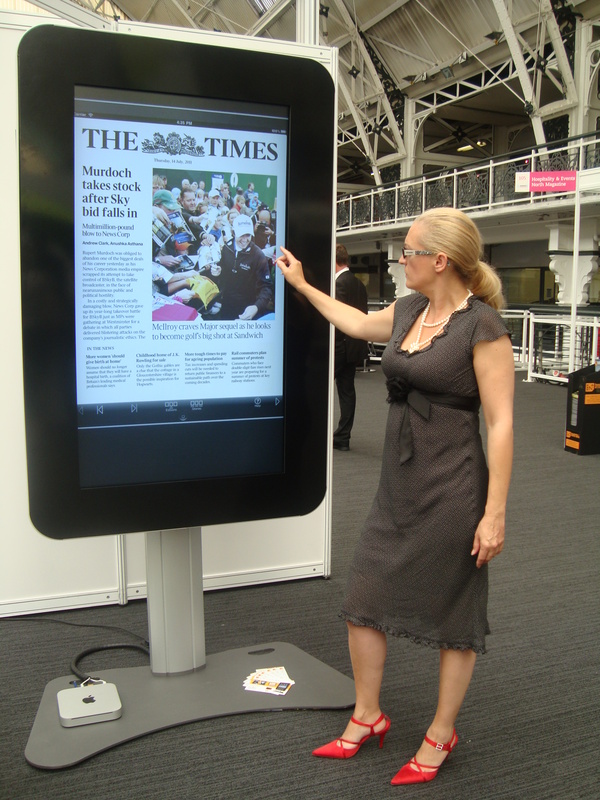 Not only that, but having a true touch-screen means the system is also good for exhibition booths. Everyone wants to walk up to it and play with the thing. The Times has just bought one to show off their new app.